After the last article I wrote last week about racism in Jasper, TX, I have received calls from residents of Jasper who say that AOL/Huffington Post called them regarding allegations that the Police Chief, Rodney Pearson, was being discriminated against because he is black. Talk about Race Baiting! The media does not care about the several white people who have filed lawsuits because they were discriminated against by the Police Chief and the City. They don't care about that. As soon as they hear that the black police chief claims he is being discriminated against, that is when they care. Can anyone say liberal media bias? On a side note, State Representative James White has had his district redrawn to include Jasper County. James White is a black conservative and one of the best representatives in the Texas Legislature. I fully support James White for re-election against Mike Hamilton.I don't support James White based on color of skin. I support James White because he is the best man for the job no matter what color he is. Colorblind is how everyone should vote. 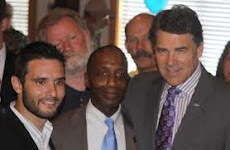 He is a super conservative and a strong leader for East Texas! Vote James White!